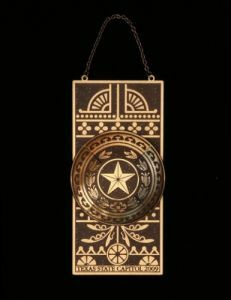 Number fourteen in the series, this year's ornament is a replica of the bold and distinctive bronze door knobs that are featured prominently on the stately doors found throughout the Capitol. Capitol hardware, including the elaborate door knobs and escutcheon plate featured as the 2009 holiday ornament, are decorated with incised designs of geometric and stylized floral motifs. This style of decoration, highly fashionable in the late nineteenth century, reflects the Arts and Crafts and Art Nouveau styles of architecture and decorative arts. In the center of each door knob is the venerable Lone Star of Texas. As bold and distinctive as Texas, it continues to symbolize the independent spirit of our state and its inhabitants.